What is the best way to address multiple remote sites using CISCO and Juniper in order to use Artica in transparent mode ? The main point of a proxy is to cache requests and send cache results trough the local network. In this case the best way is to add one proxy for each remote site. 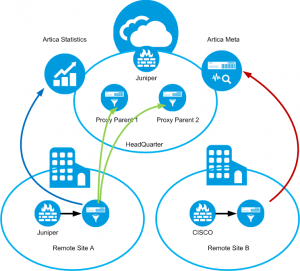 If you using cisco and Juniper, you can directly connect Artica with routers of each remote office. On the headquarter, you can add 2 artica servers act has proxy parent. Using 2 proxy gets you high availability on the headquarter ( if one is down then automatically use the next ). These proxy will be able to cache all requests from Internet and provides cached objects to the child proxys. Each child is able to cache locally retrieved objects from parents. Artica statistics is a server that can be installed on the headquarter in order to receive in real-time all requests. This to centralize statistics in order to have the global Web usage of the whole company. Artica Meta is a global management console designed to centralize all proxy into a single interface.